Ono nearly broke my mouth! Ono or Wahoo, they are one and the same! Wahoo fish is the fastest fish in the ocean and it's firm white flaky flesh is such a perfect texture for grilling. It is considered a prize fish when caught and is often called "ono". One important issue with Ono is it can be dry, so it is important not to overcook it! 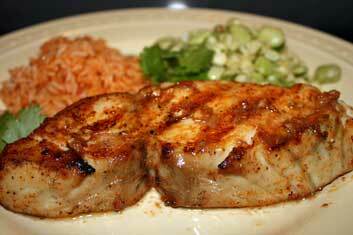 A great grilled Wahoo fish recipe is with "Mojo de Ajo" sauce. The translation is essentially "drenched in garlic". This dish is simple and a crowd pleaser.It is an easy and delicious toasted garlic butter. For garlic lovers,it will become a family favorite. Also,keep in mind that this Mojo de Ajo Sauce can be used with any fish or shellfish. I really like this with is Tombo/ Fresh Albacore Tuna, grilled medium rare. We actually brought this back from our days of living in Mexico. One important note, check out our other fish pages too! Many of the sauces and preparations work super for Ono or Wahoo! 3 to 4 cloves fresh Garlic smashed with the flat side of the knife then slice thin. Melt the butter on low heat in a sauté pan. Add garlic and increase the heat to medium. The idea here is to slowly cook the garlic and not brown it too fast. So keep an eye on the pan, the edges of the garlic should turn golden brown, remove the pan from heat, then squeeze in the lime juice. Be careful of the splatter. Grill your fish, and pour the "Mojo de Ajo: Sauce over the top. Great with typical Mexican sides, like black beans and rice and corn tortillas. We will often make a Caesar salad, which is a great compliment to the garlic flavors. This is a wonderful grilled wahoo fish recipe and the sauce can be used on any grilled fish. This grilling Ono recipe is simple and easy, quick too. Ono or Wahoo is the fastest fish in the sea, when fishing you think that a rocket took off with your bait or line. Good fun! Ono is a very lean fish and is not good cooked well done or overcooked so keep an eye on it and cook to medium or medium well at the most. Pour the sauce over your grilled delicacies. I like to serve this with a nice creamy carbonara pasta, rissoto or rice pilaf. Since the sauce is a bit Italian, those go well. Grilled asparagus goes nicely with the sauce as well. For wine, I like Four Vines Wineries Naked Chardonnay, big un-oaked chardonnay fruit or a pinot noir. Do you have a great Ono or Wahoo recipe? How about a Wahoo fishing story? Share it and you can win a set of spice rubs! Do you have a great Wahoo or Ono Recipe?We suggest that your recipe be grilled, but if you have something that is just a knock out recipe, share it. Do you have a great Wahoo or Ono fishing story? Even share your pictures! Share it with us and you will be eligible to win a set of our Spice Rubs! Then check back and see what our great grillers have to say about your famous recipe or fish story! We will select the best recipe and/or fish story based on great griller comments and our recipe test, in the case of a great fish story well it needs to be a GREAT fish story!